For information about Office 365 Cloud App Security, see Get started with Office 365 Cloud App Security. Moving to the cloud increases flexibility for employees and reduces IT cost. However, it also introduces new challenges and complexities for keeping your organization secure. To get the full benefit of cloud applications, an IT team must find the right balance of supporting access while maintaining control to protect critical data. Cloud App Security is a critical component of the Microsoft Cloud Security stack. It's a comprehensive solution that can help your organization as you move to take full advantage of the promise of cloud applications, but keeps you in control through improved visibility into activity. It also helps increase the protection of critical data across cloud applications. With tools that help uncover shadow IT, assess risk, enforce policies, investigate activities, and stop threats, your organization can more safely move to the cloud while maintaining control of critical data. For information about licensing, see the Microsoft Cloud App Security licensing datasheet. Cloud Discovery: Discover all cloud use in your organization, including Shadow IT reporting and control and risk assessment. Data Protection: Monitor and control your data in the cloud by gaining visibility, enforcing DLP policies, alerting, and investigation. Threat Protection: Detect anomalous use and security incidents. Use behavioral analytics and advanced investigation tools to mitigate risk and set policies and alerts to achieve maximum control over network cloud traffic. Using Cloud Discovery to map and identify your cloud environment and the cloud apps your organization is using. Sanctioning and unsanctioning apps in your cloud. Using easy-to-deploy app connectors that take advantage of provider APIs, for visibility and governance of apps that you connect to. Using Conditional Access App Control protection to get real-time visibility and control over access and activities within your cloud apps. Helping you have continuous control by setting, and then continually fine-tuning, policies. For more information about Microsoft Cloud App Security data retention and compliance, see Microsoft Cloud App Security data security and privacy. Cloud Discovery uses your traffic logs to dynamically discover and analyze the cloud apps that your organization is using. To create a snapshot report of your organization's cloud use, you can manually upload log files from your firewalls or proxies for analysis. To set up continuous reports, use Cloud App Security log collectors to periodically forward your logs. For more information about Cloud Discovery, see Set up Cloud Discovery. You can use Cloud App Security to sanction or unsanction apps in your organization by using the Cloud app catalog. The Microsoft team of analysts has an extensive and continuously growing catalog of over 16,000 cloud apps that are ranked and scored based on industry standards. You can use the Cloud app catalog to rate the risk for your cloud apps based on regulatory certifications, industry standards, and best practices. Then, customize the scores and weights of various parameters to your organization's needs. Based on these scores, Cloud App Security lets you know how risky an app is. Scoring is based on over 70 risk factors that might affect your environment. App connectors use APIs from cloud app providers to integrate the Cloud App Security cloud with other cloud apps. App connectors extend control and protection. They also give you access to information directly from cloud apps, for Cloud App Security analysis. To connect an app and extend protection, the app administrator authorizes Cloud App Security to access the app. Then, Cloud App Security queries the app for activity logs, and it scans data, accounts, and cloud content. Cloud App Security can enforce policies, detects threats, and provides governance actions for resolving issues. Cloud App Security uses the APIs provided by the cloud provider. Each app has its own framework and API limitations. Cloud App Security works with app providers on optimizing the use of APIs to ensure the best performance. Considering the various limitations that apps impose on APIs (such as throttling, API limits, and dynamic time-shifting API windows), the Cloud App Security engines utilize the allowed capacity. Some operations, like scanning all files in the tenant, require a large number of APIs, so they're spread over a longer period. Expect some policies to run for several hours or several days. You can use policies to define your users' behavior in the cloud. Use policies to detect risky behavior, violations, or suspicious data points and activities in your cloud environment. If needed, you can use policies to integrate remediation processes to achieve complete risk mitigation. Types of policies correlate to the different types of information you might want to gather about your cloud environment and the types of remediation actions you might take. 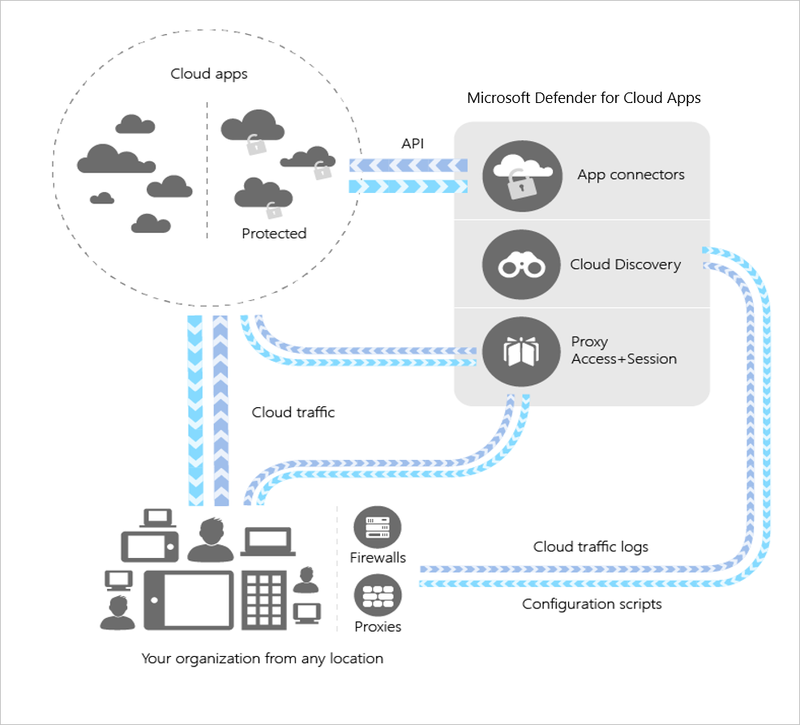 Read about the basics in Getting started with Cloud App Security. Premier customers can also create a new support request directly in the Premier Portal..